Labor Day marks the "unofficial" end to summer...it seems this year our summer has flown by and we're not ready to say farewell to our favorite season just yet. 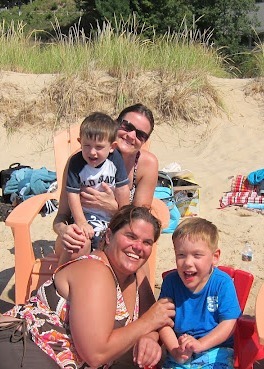 And fortunately for us, swimming and playing in Lake Michigan felt like mid-summer versus Labor Day weekend! The water temps were perfect and there were plenty of playmates to hang out with. 'Auntie' Jo and Will ventured to the big lake and spent the night. Cousin Annie hung out with 'her monkey boy' Cam and the weather couldn't have been better. Good friends Keith and Bobbi spent Sunday with the family and brought some delicious burgers for one of the last seasonal cookouts and dinner on the deck. Chris' talents are endless and the "monster" watermelon shown here was created and carved by Cameron's dad. Due to an excessive amount of sand gathered on the shoreline, Will and Cam cleaned up very nicely in a sudsy bath. What an awesome cottage weekend complete with Grandma, Grandpa, Aunts, Uncles and lots of cousins!! Monday marked another sunny day and a very special birthday party for Will's 4th! It was a pirate themed celebration complete with a scavenger hunt and treasure. 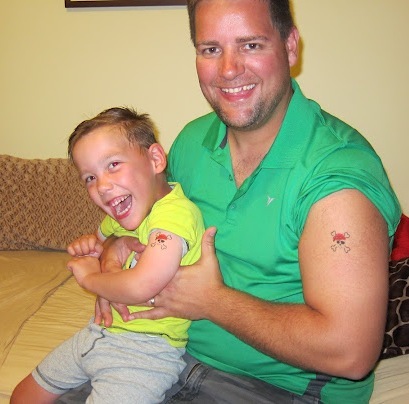 Cam and his parents used one of the goodie bags treats on themselves in the form of a pirate tattoo. Cameron and his dad sure do look like swash-buckling pirates- argh! !